GFOS 2013 | News | Eisenberg Racing - Max Your Life. After 24 months of hard work and regular 18 hour days, we are proud to announce the launch of the MADMAX Turbine ‘Streetfighter’ motorbike at the 20th Anniversary of Goodwood Festival of Speed. The bike is powered by a Rolls Royce Allison C20B shaft (jet) turbine, producing 450bhp, and weighs just 240kg, thanks to a combination of titanium, alloy and carbon kevlar parts. Speeds in excess of 220mph in 1 mile and acceleration of 1.5g will be possible from just a two speed semi-auto box. The turbine is the same one that powers an Augusta 109a six seat luxury helicopter. Due to the design of the C20b turbine, the turbine is not thrust and produces no flames at all. The turbine actually powers the rear wheel via a sprocket, making it a safe and the possibly the world’s most unique riding experience, with a sound that is unique by quieter than most performance motorbikes. The bikes have been modified to run on regular pump diesel, no race or jet fuel is required. Subject to availability there is also the option to run it on 100% biofuel (recycled vegetable oil), making it very environmentally friendly. New bikes will be for sale at a price of £175,000 + depending on options, at strictly limited numbers. Any customers will have to be approved for suitability and riding experience. All the development for this bike has been done locally in Guernsey, using a collection of specialists across the island. All the specialist CNC metal work, carbon/Kevlar fairings and turbine problem solving have been designed and manufactured in Guernsey. The original MTT Turbine bike was launched in 1998 and soon became an iconic, cult bike, due to it using a jet turbine from a Bell 206 Helicopter. In 2009, Zef Eisenberg had a meeting with MTT in the USA where it was agreed that the R&D, design and development of the new generation of Turbine bikes will be in Guernsey. Over the last few years a considerable amount of testing has been done to take the bikes to the next level of engineering excellence, culminating with the British Land Speed record for Turbine powered bikes in 2012 by Zef Eisenberg, demonstrating that these bikes are not just for show, but actually work. This latest bike will be sponsored by extreme sports clothing brand MADMAX Race Team, and Tag Heuer to launch their new Mikrotimer 1000 – the worlds most accurate chronograph. 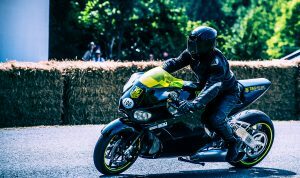 Lord March, owner of Goodwood invited Zef Eisenberg to attend and ride the famous Goodwood hill climb 2013 on the new streetfighter bike along with the British Land Speed record bike. Zef Eisenberg; “We were very honoured to be invited to attend the 20th Anniversary of the GFOS to showcase our latest bikes. I am very pleased that we can produce such amazing work in Guernsey using local expertise. Many people are unaware of the capabilities of the local engineering excellence and we hope these incredible bikes demonstrate to outsiders that Guernsey can compete with the best of them. All the people and my race team have been incredible, pulling out all the stops to get the bike finished and looking fantastic in time for Goodwood on the 12,13,14th July. Maxicorp Ltd (Autosport) is a specialist division focusing on design and engineering for special vehicle projects, cars and bikes. Tag Heuer is a trademark of LVMH. MADMAX is a trademark of Maxicorp Ltd across all classes. Zef Eisenberg was the founder of Maximuscle Ltd, owner of Maxicorp Autosports and MADMAX, the motorsports clothing brand.